The California Apricot, one of nature's nutritional powerhouses, not only has a rich history, but is also the leader of apricot production in the United States. Over 300 growers in California, covering 17,000 acres in the San Joaquin Valley, produce over 95% of the apricots grown in the United States. Most apricot farms in California are small, family-owned businesses that pride themselves on growing one of California's most prized specialty crops. This small, delicate fruit not only packs a powerful punch of nutrients, but is also extremely versatile due to its sweet, tart flavor, variety of menu uses, and the variety of ways it is produced, packaged and sold. Apricots can be purchased fresh, canned, frozen, pureed, dried and as nectar both in juice and concentrated form. Their compatibility with other foods makes apricots a favorite with home and professional chefs alike! Gourmet Magazine has referred to the California Apricot as "the best dried apricots" available! Nutritionally, California apricots are a powerful source of disease fighting anti-oxidants and are one of the healthiest and most beneficial fruits available. They are rich in beta-carotene, Vitamin C, potassium, iron, Vitamin A, copper, lycopene, and the apricot seed has an extremely high content of B17 or laetrile which has been found effective in preventing cancer. They are also very high in fiber and have the additional nutritional benefits of being low in saturated fat and sodium and do not contain any cholesterol. Because of these rich nutrients, the California apricot aids in treating a variety of health concerns - anemia (due to its high iron content), constipation (due to its high fiber content), digestion (it has an alkaline reaction in the digestive system), eyes and vision (its high Vitamin A content, especially found in dried apricots, is essential to maintaining and improving eyesight), fever (combined with honey and mineral water it can help cool fevers), and skin problems (fresh apricot leaves can be applied to scabs, sunburn, itchiness and eczema). The California apricot's unique mix of anti-oxidants makes it a good choice for fighting heart disease, cancer and stroke. The beta-carotene found in apricots makes them a premium source of this nutrient with just three fresh apricots providing almost 30% of the daily recommended amount. The history of the California apricot started 4000 years ago when it was discovered on the mountain slopes of China. From there this ancient fruit found its way across the Persian Empire to the Mediterranean. Spanish explorers introduced the apricot to California in the 18th century, and recorded history indicates in 1792 the first major California crop was produced. By 1920, the California apricot was flourishing in the Santa Clara Valley. Eventually California apricot farms found their way to the San Joaquin Valley after World War II and the ensuing growth of the computer industry in the Santa Clara Valley. Today, California apricot farmers face a variety of challenges - competition from lower priced apricots from other countries including Turkey, South Africa, Argentina and Chile; bankruptcy and the decline in purchasing power by Tri-Valley Growers (formerly the industry's largest processor) and their successor; unpredictable weather conditions in California; changes in consumer habits; and a notable lack of publicity and education compared to many other fruits. However, the Apricot Producers of California (or APC), is working hard to change that. 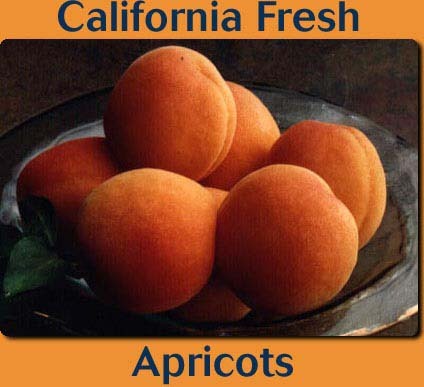 They have produced a consumer handout which features practical information about California apricots. It contains nutritional information, serving suggestions, tips on using and selecting California apricots, and how incorporating apricots into a lifelong lifestyle is a great way towards healthier eating habits. This organization is also actively involved in lobbying governmental and trade organizations; sponsorship of a variety of educational and informational efforts to the foodservice industry, dieticians, and consumers; participation and attendance of trade shows; launch of a website; and continued media enhancement. Because of their versatility, California apricots can be easily added to the daily diet and a variety of dishes. Canned apricots can be added to cereals, yogurt, cottage cheese and smoothies. Fresh, canned, frozen or even dried apricots can be served on top of waffles, pancakes, and incorporated into a variety of desserts including freezing and making into sorbets. They can also be pureed and used as a fat substitute. And they are refreshing and healthy just as a snack - fresh, canned or dried! Food chefs have found apricots to be complimentary and easily combined with a variety of other food ingredients - chicken, lamb, pork, duck, rice, couscous, onion, wheat, ice cream, salads, nuts, caramel, and raisins and work very well with spices and herbs such as garlic, basil, nutmeg, tarragon, cumin and curry. And chocolate covered apricots are a special treat! In choosing California Apricots, one should look for fairly firm, plump apricots with an orange-yellow to orange color. They are fully ripe when they are soft to the touch and juicy - this is when they should be eaten. Storing apricots in the refrigerator will keep them from over ripening. A hard apricot can be ripened by placing it in a paper bag for one to two days. To freeze apricots, simply cut the fruit in half and place on a baking sheet until frozen - they can then be packed in a plastic freezer bag. Green apricots should be avoided as they will not ripen. Dried California apricots are easy to spot - they are dried in halves and are darker orange than other apricots. Their flavor is much more intense and sweetly tart. The versatility and amazingly healthy benefits of California Apricots make them a smart choice for consumers and foodservice professionals. They are a good way to power-up daily healthy food habits. Their sweetly tart flavor earns them the distinction of being one of the most prized specialty fruits available. Fresh fruits and vegetables are part of a healthy life style along with exercise, cleansing, adequate sleep, avoiding excess stress, etc.